Buy Online Now! - Rare Black Sorrows Rock Concert Posters and Memorabilia. Any examination of The Black Sorrows inevitably comes down to one person. Joe Camilleri (singer, songwriter, saxophonist, producer and the brains behind The Black Sorrows) is one of the most genuinely talented figures in Australian music. 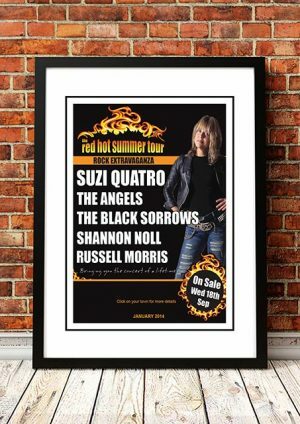 Leader of two of Australia’s most successful bands, Jo Jo Zep and The Falcons and The Black Sorrows, Joe’s milestone of songs include So Young, Hit And Run, Shape I’m In, Hold On To Me, Harley and Rose, Chained To The Wheel , Never Let Me Go and the Chosen Ones. 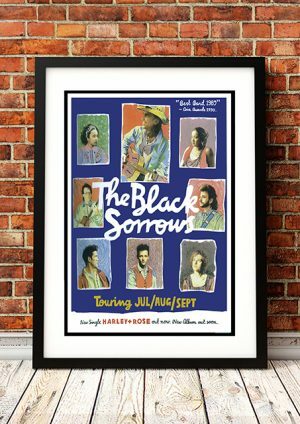 We stock a great Black Sorrows band concert poster.